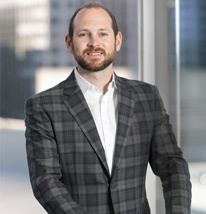 Todd began his career as an analyst at Bourne Partners. Throughout his tenure with the firm, he has worked across all facets of its business activities. Todd’s experience includes mergers and acquisitions, capital raising, direct and fund investing, and strategic consulting. At Bourne Partners he is responsible for supporting and executing the firm’s investment banking initiatives. Todd received a B.S. in business administration with a concentration in Finance and Minor in Economics from the University of North Carolina at Charlotte. Outside of work Todd enjoys spending time with his wife, Leah, and their dog, Lola. He is an active supporter of The Leukemia & Lymphoma Society (LLS) as well as The Relatives, a system of resources that helps children and youth find shelter and support.